Superdrug Nail Shaper - If my nails look a little uneven I have a nasty habit of biting them, so to stop myself being tempted to nibble I always have a nail file to hand! Bee Good Vanilla & Honey Lip Balm* - The first thing you need to know about this is that it tastes like ice cream. The second thing is that the formula glides onto your lips effortlessly without leaving a sticky residue; it leaves a nice sheen to your lips which I think is perfect for when your lips are feeling dry and you don't have the time or inclination to apply a colour. 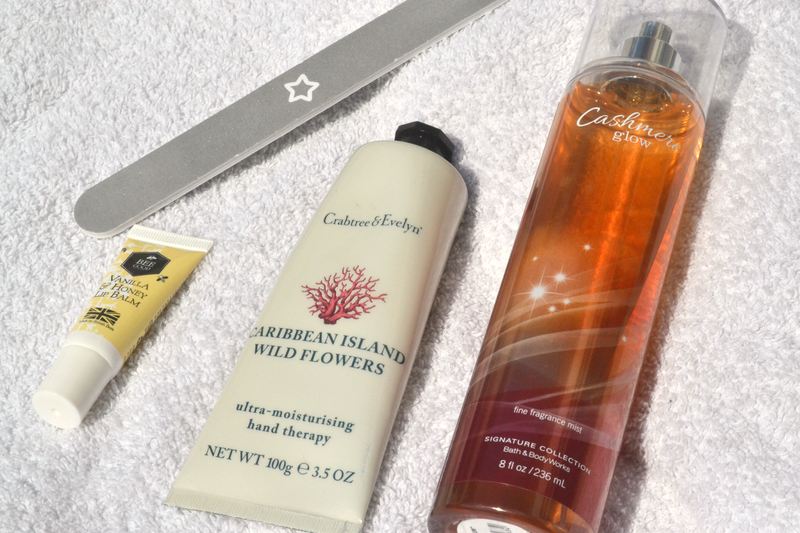 Crabtree & Evelyn Caribbean Island Wild Flowers hand therapy* - I seem to go through numerous hand creams which never really get appreciated on here but this one had to have a mention. It smells amazing and leaves my hands feeling powdery soft; there's not of that sticky or slippery feeling for ages after application, it absorbs quickly and makes my hands feel lovely. I love the tube style too! Bath & Body Works 'Cashmere Glow' fine fragrance mist - I couldn't go to the states and not go in a Bath & Body Works; it was my first experience so I spent a considerable amount of time choosing what I wanted. I got three of these fragrance mists and this is the first one I've cracked open since I got home; the bottle is big and it does take up a bit of room in my bag but I love it so much I can't resist not carrying it round with me. If you're off to the States you definitely need to take a trip to Bath & Body works, Cashmere Glow is a peachy vanilla kind of scent but they honestly have a massive choice of different fragrances you're totally spoilt for choice.